Sebastiano Joseph Peluso, known as Yano to family, was the only Buslee crew member who was still unaccounted for. George Edwin Farrar’s family knew he was a POW and all of the other families had heard that their sons had been killed on September 28, 1944 in the mid-air collision between Lead Banana, carrying the John Oliver (Jay) Buslee crew, and Lazy Daisy, carrying the James Joseph Brodie crew. On the Brodie crew, all of the families had been notified except for Brodie’s family. 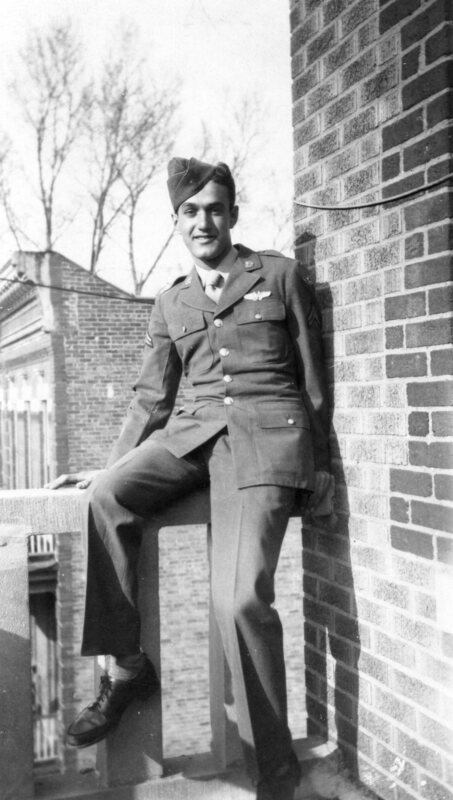 Three of the Brodie crew were POWs – Harry Allen Liniger, Wilfred Frank Miller, and George Marshall Hawkins, Jr. The rest of the crew had been reported killed in the collision. Seven months of not knowing the fate of their son gave the Pelusos hope that he was still alive. I should have thought of writing you sooner. Kindly forgive me for putting this letter off so long. I am hoping that your letter in return will have some good news about your dear son. Since many German Prison Camps have been liberated by our armies. I do pray, and have prayed, that George was fortunate enough to be one of the many boys to be released. As you know, the 28th of this month will make 7 months since the time our boys went down in Magdeburg – and since then, not much has happened. As yet, we have not received any news concerning our dear son, Yono. My husband and I strongly believe that our son is hiding somewhere. Lately we have all been impatient for some kind of news since Magdeburg is just about being captured by the 9th Army. I pray and hope that by the time this letter reaches you I will get the news I have been waiting for for 7 months. Have you heard from any of the other parents and wife’s of the crew members? If so I will deeply appreciate you letting me know. May I hear from you soon – God Bless You – and may your son be with you soon. Mrs. Antonetta Peluso was the mother of the Buslee crew’s radio operator/gunner, Sebastiano Joseph Peluso, aboard the Lead Banana on September 28, 1944. Both she and her husband, Joseph, were born in Italy and had immigrated to the United States. Sebastiano, better known as Yano to the family, and his older sisters were born in New York. Sebastiano was the youngest, born July 8, 1924. Sister Sala or Sarah (different sources report different names) was nine years older, and Jennie or Jean (different sources report different names) was seven years older than Sebastiano. During the war, the Pelusos lived in Brooklyn, New York. I received your letter last week, and it makes me happy to know your dear son, George, is safe in a German Prison Camp. Let us hope it won’t be long now, that he will be home once again. As yet I have not received any information concerning my son Sebastiano. I am waiting patiently for news that will lighten the heavy burden in my heart. I was deeply sorry to read about 1st. Lt. William A. Henson II. Mr. Carey S. Stearns has also received the same news about his son 1st Lt. Robert S. Stearns. I am praying that the German Government made a mistake in the reports Mrs. Henson and Mr. Stearns received. Mrs. Farrar, I wish you all the Luck in the world in your dear son’s safety. I will inform you if I get news about my son.